Ready to sell some of your jewelry items you no longer want or need? Diamond Jim’s is the place to go to sell your vintage pieces, designer watches or gold, silver or platinum jewelry. Below is a list of some of the items that we purchase. We will give you cash for jewelry, cash for gold, cash for silver and more. 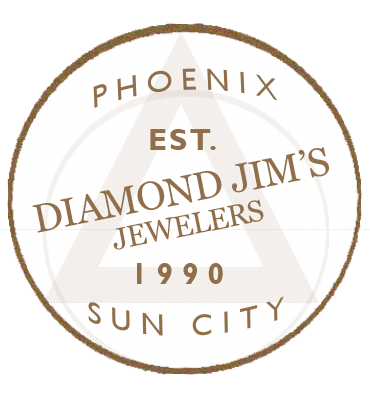 Diamond Jim’s has some of the best prices for gold in Phoenix and Sun City. We pay top dollar for luxury brands such as Tiffany, Breitling, Movado, Cartier, Dior, etc. If you have something that’s not on this list, please call us at our Phoenix location 602.466.1772 or our Sun City store 623.977.2299 for a free, confidential evaluation. You can also send an email or use our contact form here. We will buy it all (except costume jewelry) for a fair price! At Diamond Jim’s we do our very best to make sure you get the very most for your valuables. If you ever receive an offer that is better, please let us know about it. We will sharpen our pencil and work our hardest to make sure you get the most from us.